Here is some information that will help you understand our Drilling service and our standard procedures when it comes to Three Hole Drill/Punch. A hollow drill bit used in a paper drilling machine to produce 1 or more holes in paper stock placed between the drill bit and drill table producing round holes 1/8″, 1/4″, 5/16″ and 3/8″ Dia. Drilling often produces edges that are clean and round and adjoining sheets that are stuck to each other at the drilled hole. Very flexible between hole and hole to paper edge positioning. punch is used for Lamination pages only. The position of the holes in stock is determined from a customer-supplied sample. In the event the customer instructions are “Use a standard” hole and pattern we must advise them there is not a standard that applies to all jobs. We have adopted the following as Clear Standards when the customer has signed off on preparing a customer sample for holes. 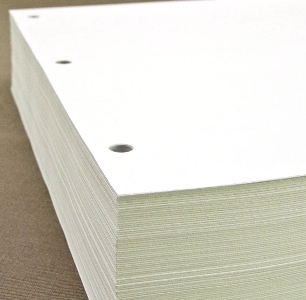 5/16″ Dia holes (either drilled or punched at our discretion) located within the book such that the holes do not break into the binding hole or glue. This could put the center of the 3-holes as much as 1/2″ or more into the book as measured from the bind edge. A hole pattern 4.25″ between hole centers with a 1/4 or 5/16″ Dia hole placed 5/16 to 3/8″ to center of hole from spine edge of paper, similar to the holes punched on a “Punchodex No. P-39” office supply 3-hole punch.